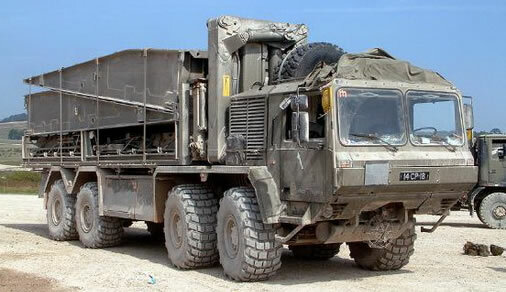 Former British Firm Universal Power Drives developed a truck to compete in the British Armies bidding for a family of military trucks during the late 80’s early 90’s, which included DROPS, tank transporter and other specialist roles, known as Unipower M-series. However the vehicle was only ordered for one specialist role, transportation of the BR90 family of bridging systems modular aluminium alloy sections. The British Army took delivery of 190 of these vehicle from 1997 onwards. 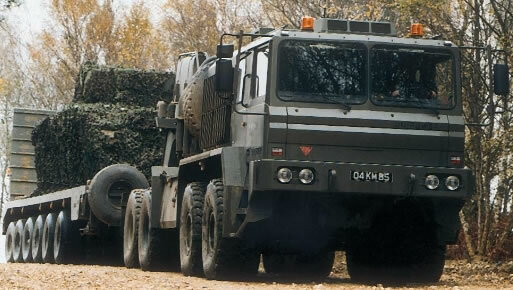 The MH-6600 6×6 tank transporters variant, with associated semi-trailers was also purchased by Oman. By this time Universal Power Drives was purchased by former Alvis, who in turn were purchased through takes over BAE Systems. The vehicle was renamed the Alvis Unipower, but is no longer manufactured or marketed. The all-metal cab accommodates driver, plus 4 passengers. The cab is equipped with an independent heater and air conditioning system. Some vehicles have a roof hatch. A roof-mounted machine gun mount can be fitted if required.